The countless variety of rivers, waterfalls, mountains, and glaciers along Iceland’s Southern Coastline is spectacular. 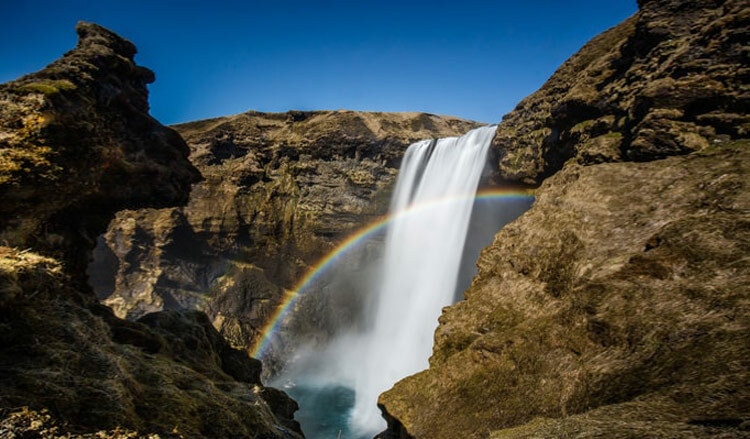 The South Shore Iceland day tour takes you along the south coast of Iceland to visit two gorgeous waterfalls. 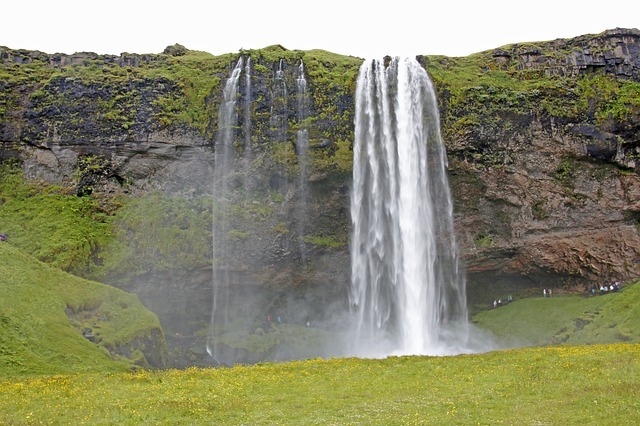 The first waterfall we stop at is Seljalandsfoss. Seljalandsfoss you can walk behind the waterfall and through to the other side. This makes for a unique experience. Then we move into the magical Skogafoss. 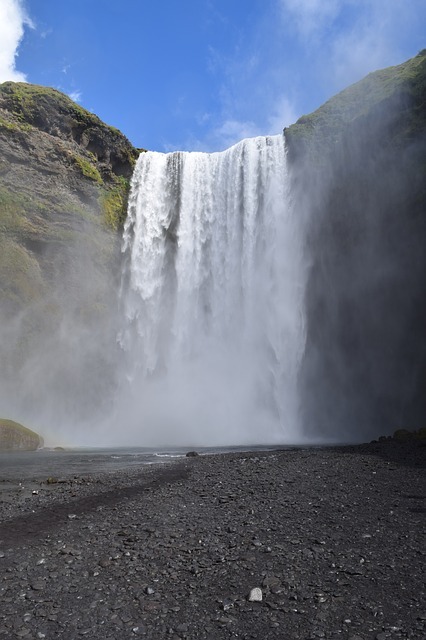 Skogafoss 60 meter high waterfall situated on the Skoga river in the south of Iceland at the cliffs of the former coastline. 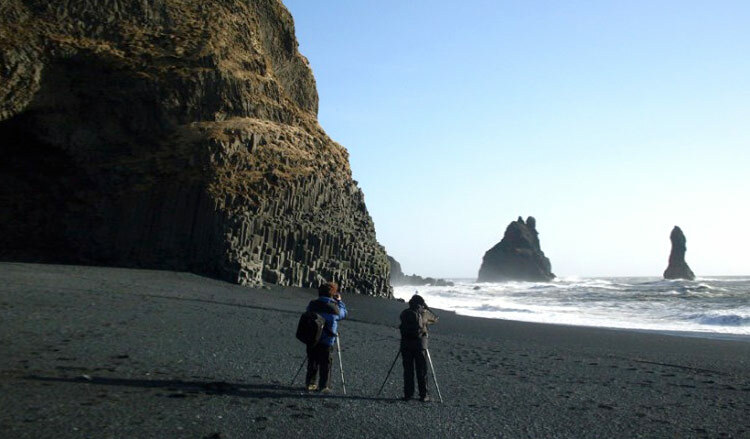 On the South shore Iceland day tour you will stop at the black sand beach Reynisfjara. 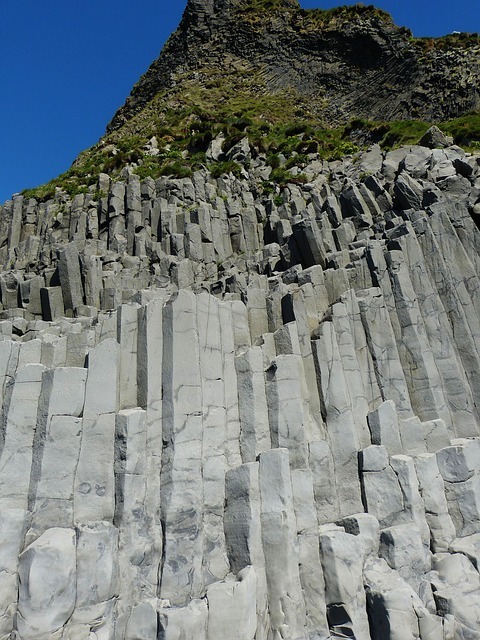 Reynisfjara beach is a beautiful black sand beach under Reynisfjall mountain with amazing basalt columns called Reynisdrangar. 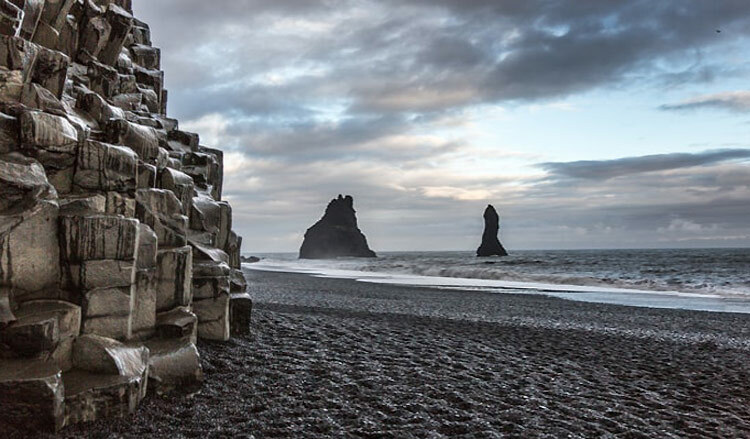 The basalt rock stacks tower up from the sea by Reynisfjara in south Iceland to make a natural work of art. We will also visit the glacier snout of Solheimajokull, an outlet glacier of Myrdalsjokull, an ever changing and moving natural wonder. Grand Golden Circle and Southern Iceland tour. Ragnar And Joinsi the drivers for Bus Travel of Iceland tours were extremely informative which made the tours of these fantastic sights so much more enjoyable.I also enjoyed being driven around in a small bus and getting there before all the larger coaches arrived. We went on the Southern Iceland tour mid-December, also opting for a glacier-climbing experience. We got picked up at the Grand Hotel as expected, and boarded a cozy minibus that already picked up quite a few tourists. We still had a few hours before sunrise (apparently there are only about 5 hours of sunlight in Iceland, from 11-ish to 4, and our tour started around 8.30). On the way to our first destination, the driver told us old viking stories from the Icelandic Sagas. We had a first technical stop, to grab a coffee and then went straight to the first waterfall that we visited (with a name I can’t pronounce or write). Afterwards it was time for us to part ways with the less adventurous passengers and we went for the glacier climbing. We got picked up by the climbing team and got hooked up with warm overall suits, proper boots, gloves and snow walking shoes with matching sticks. Unfortunately there was too much wind on the top of the glacier for us beginners to be climbing safely, so we had to settle for regular hiking. However, I can say hands-down that it was the most awesome hiking experience I’ve had. The weather was perfect for hiking, with a gorgeous blue sky, perfect for awesome pictures. Three hours later, we got back together with the rest of the initial group and went to the last point of our tour, a gorgeous frozen waterfall. I will definitely consider Bustravel in the future, if I ever come back to Iceland.